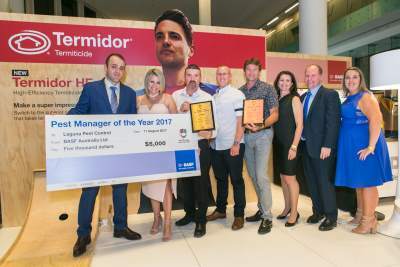 Nominations are now open for Pest Manager of the Year 2018. Thank you to BASF who have again generously agreed to sponsor the national award. The winners will be announced at the Gala Dinner at the AEPMA National Conference in September 2018. The deadline has been extended and entries are now due by COB 27th July 2018 – please find links to entry forms and competition rules below. Business Award Two Clases: Pest Management firms employing 10 or more people, pest management firms employing fewer than 10 people. National Pest Manager of the Year will be awarded from nominees in these 2 categories. South Pacific Pest Manager of the Year, opent o AEPMA member businesses both large and small operating in the South Pacific Region. If you have any questions about this recognition of excellence in our industry please contact the national office on 07 3268 4210 or 1300 307 114. Click here to download 2018 Entry Guildines - Pest Manager of the Year Awards. Click here to download 2018 PMYA Nomination Form - South Pacific Pest Manager of the Year Award .